Pocketful of Treasures: 4 Reasons You Need Boggle Jr in your Homeschool Classroom! 4 Reasons You Need Boggle Jr in your Homeschool Classroom! I cannot remember whether someone generously gave us Boggle Jr. or if we found this gem at a garage sale, but it has been a favorite in our homeschool classroom. Spell a word with the letter dice. Have the child sound out the word and find the matching picture card. Place the sight word flash card in the holder (cover up the word for more advanced students) and match the letter dice to the flash card. I will say one of their spelling words and the child will spell the word using the letter dice. I will then reveal the flash card of the word and the child will check his/her work, make any necessary corrections, and repeat the word and its spelling aloud. Occasionally I will have them roll the letter dice and I will try to make a word out of their roll. The student will then phonetically sound out the word and try to use it properly in a sentence. Mix it up and keep it fun! 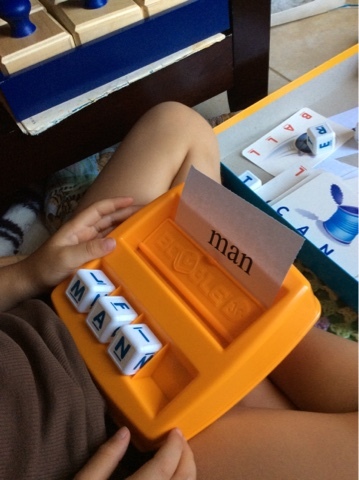 There are so many possibilities with this Boggle Jr. Sometimes we will play a game to see how many times they have to roll the dice to spell each word. Other times we see how many words they can spell or sound out in a certain amount of time. We do not limit ourselves to the cards that come with the game, but often use our own flashcards to go with that week's lesson. For Boggle Jr. and other fantastic products to enhance your homeschool, visit my affiliate Mansion Select.